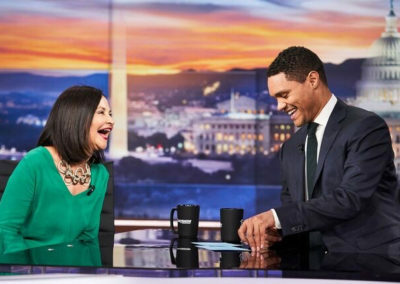 Trevor Noah, host of Comedy Central’s The Daily Show (TDS), was, literally, born a crime. His existence was illegal in South Africa in 1984 because of apartheid. His mother is South African and his father is German. 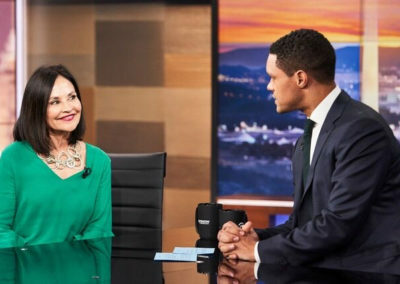 When you read his book Born A Crime, Stories from a South African Childhood,you will understand why Trevor Noah epitomizes the Iron Caterpillar who transforms into an Iron Butterfly. Trevor’s mother and grandmother, who are also Iron Butterflies, shaped him into the man he is today. He learned how to use humor to survive several terrifying childhood experiences. Because of his mother’s faith, consistency and perseverance, Trevor learned a lifetime of resilience skills and now is teaching his audiences to see the world from different perspectives. 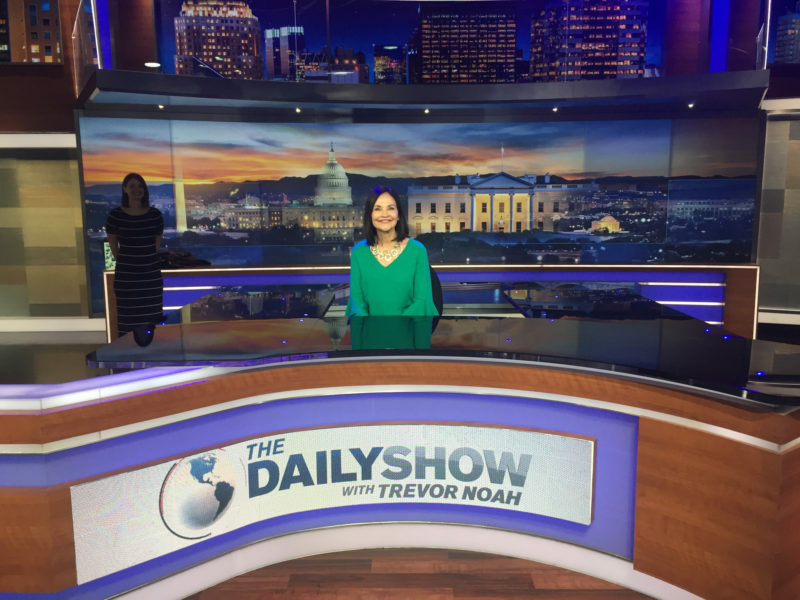 I was the “one lucky winner, chosen at random” to fly to New York, watch a taping of The Daily Show on April 26, 2018, and to be interviewed on the set by Trevor Noah. All for a small donation to NEXT for AUTISM. My daughter, Caroline, was my plus one. We were greeted at our hotel by Emma Gullickson, the Event Coordinator at Omaze (the company that funded our trip). Her outgoing personality put me at ease right away. 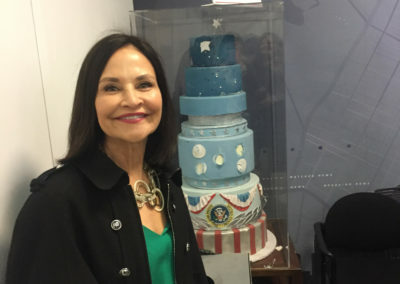 We were whisked away to the studio, taken quickly through the VIP line, into our own green room, right next to their real guest, Yale Law Professor, James Forman, Jr. The jury delivered a guilty verdict in the Bill Cosby sexual assault case just before we arrived to the studio. So, the writers were scurrying around to make last minute changes to the show. We watched in amazement how everyone could work so quickly and calmly to keep the taping close to the timeline even with last minute breaking news. Caroline and I walked into the studio where their director, producer, camera crew, stage and sound managers were warm and welcoming. Besides receiving all sorts of TDS swag, we were treated like rock stars. 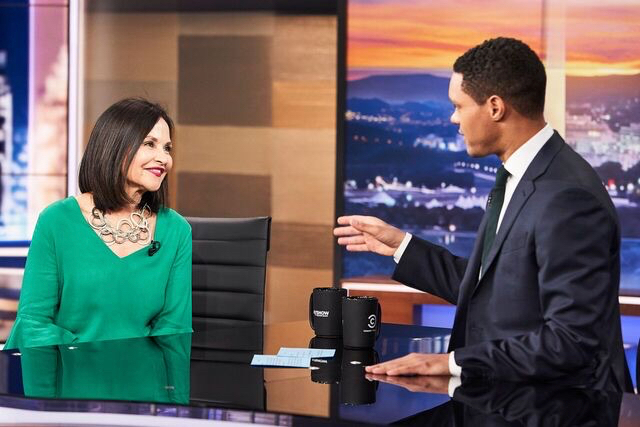 After the taping with Dr. Foreman, they took me back stage to check my microphone and show me where to stand. The producer briefed Trevor on why I was there and a little about Iron Butterflies Project. 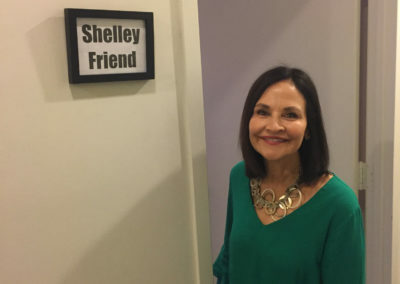 Before he walked on stage, he introduced himself, flashed his beautiful dimpled smile and said, “you’re going to be great.” Moments later, he introduced me to his studio audience and I walked out to be interviewed about Iron Butterflies Project. 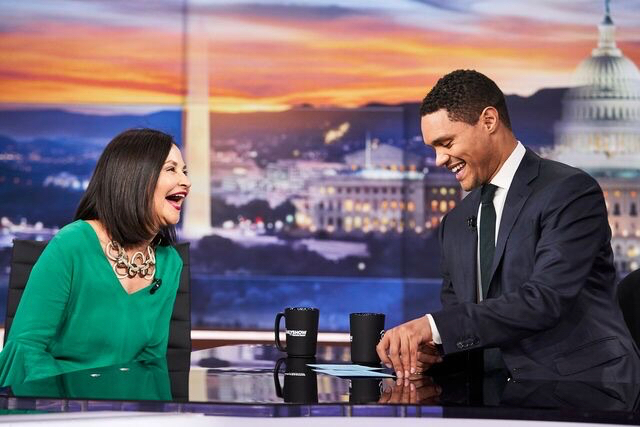 Trevor Noah was everything I hoped he would be. He was charming, genuine, compassionate, kind and funny. It was a pleasure to meet him and his team and it was a very special day. 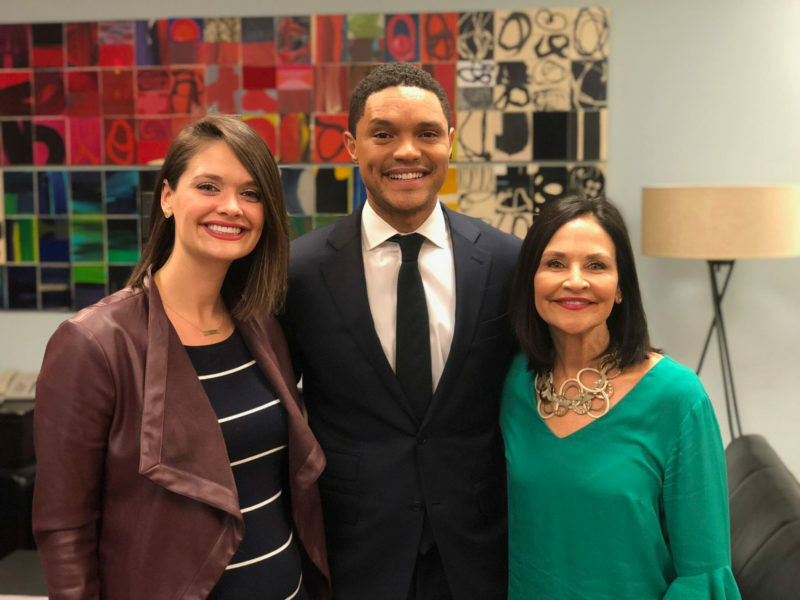 Trevor recently established Trevor Noah Foundation, non-profit organization. It is designed to educate and teach life skills to orphans and vulnerable youth in South Africa. 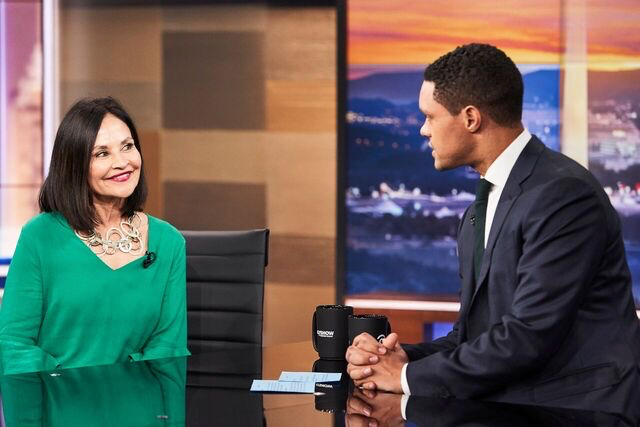 We want to acknowledge and honor Trevor Noah Foundation with our #ButterflyKisses. 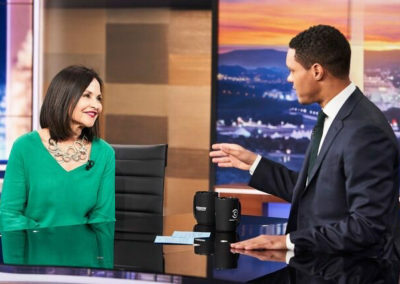 The goal of Trevor Noah Foundation is to support and prepare children and youth for success after high school by either attending technical/vocational schools or colleges/universities. 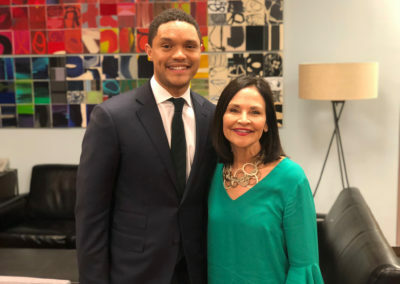 The priorities of Trevor Noah Foundation are psycho-social support, skills development, and career guidance for the 3.7 million orphans and at-risk children. I won The Trevor Noah Experience, through Omaze, because of a donation to NEXT for AUTISM. It “is a non-profit organization that strategically designs, launches and supports innovative programs to improve the lives of people living with Autism Spectrum Disorder (ASD).” Their organization has strategic goals of helping people with autism at every stage of life through programs, community integration, and coordination of resources. Omaze, like Iron Butterflies Project, is committed to storytelling. They created their business model around the premise of connecting people through stories. 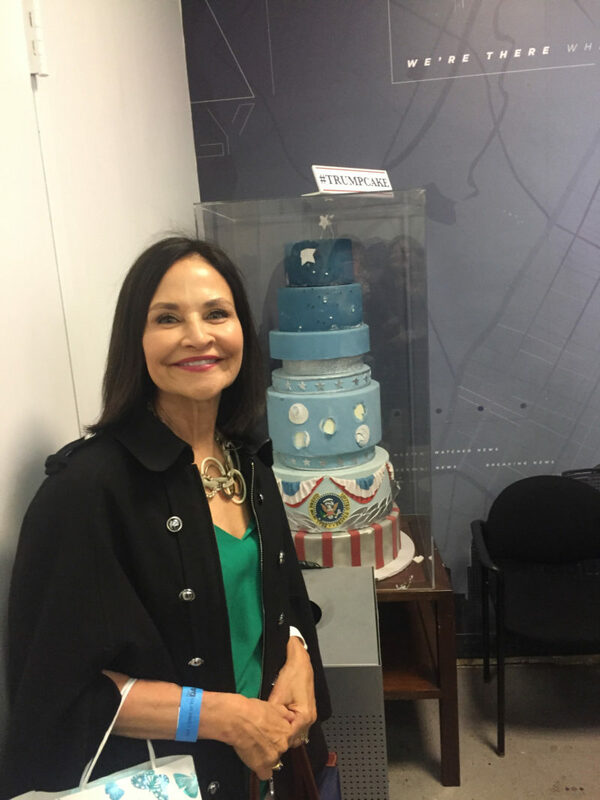 They link “the power of story and technology to transform lives.” Omaze helps non-profit organizations achieve higher fundraising goals by offering “once-in-a-lifetime experiences” for one donor for each cause. 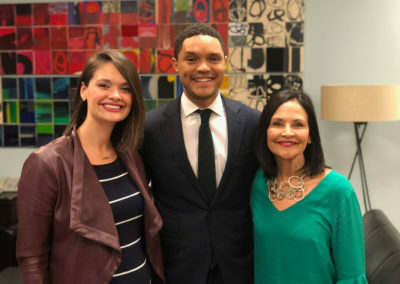 Trevor Noah (born 20 February 1984) is a South African comedian, writer, producer, political commentator, actor, and television host. He is known for hosting The Daily Show, an American satirical news program on Comedy Central. Born in Johannesburg, Noah began his career as a comedian, presenter, and actor in his native South Africa in 2002. He held several television hosting roles with the South African Broadcasting Corporation (SABC), and was the runner-up in their fourth season of Strictly Come Dancing in 2008. From 2010 to 2011, Noah was the creator and host of Tonight with Trevor Noah on M-Net and DStv. His stand-up comedy career attained international success, leading to appearances on American late-night talk shows and British panel shows. 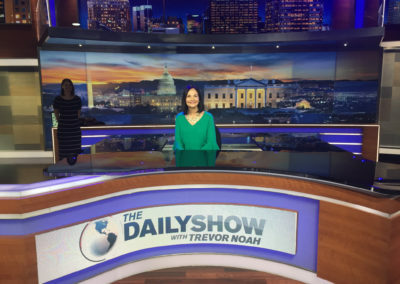 In 2014, Noah became the Senior International Correspondent for The Daily Show, and the following year, he succeeded long-time host Jon Stewart and is set to remain in this position up until 2022. Photo courtesy of Sean Gallagher.